YEREVAN—President Armen Sarkissian on Wednesday recommended the appointment of Bedros Terzian as interim executive director of the Hayastan All-Armenia Fund who will step in following the resignation Monday of the fund’s embattled director Ara Vardanyan who was arrested on charges of misappropriations of funds. Sarkissian also recommended that the Hayastan Fund Board accept Vardanyan’s resignation. Vardanyan admitted to using the fund’s credit card for online gambling. After posting a 1 million dram bail, he returned to the Hayastan Fund offices before submitting his resignation two days later. Terzian has served as chairman of the Hayastan Fund’s France affiliate and also serves on the fund’s national board. Terzian also has been tasked to appoint and chair a commission to select a new executive director. This group will include representatives from the offices of t he Armenian Prime Minister and President of Artsakh, as well as Albert Poghosyan, a member of the Hayastan Fund board. Terzian was born in 1948 in Beirut where he earned degrees in economics from Saint-Joseph University, philosophy from L’Ecole des Lettres and computer sciences from L’Ecole Supérieure des Ingénieurs. He received a doctorate in economics from Paris’ famed Sorbonne University. He was a co-founder of the Petro-Money Report at the Financial Times in Beirut and London, deputy director of the Arab Center for Oil Studies in Paris, and was a professor at University of Grenoble. Terzian has held leadership roles in the French affiliate of the Hayastan All-Armenia Fund since its inception. Me. Terzian is absolutly the most qualified individuale to manage the All Armenia Fund. I have known him for over 25 years. 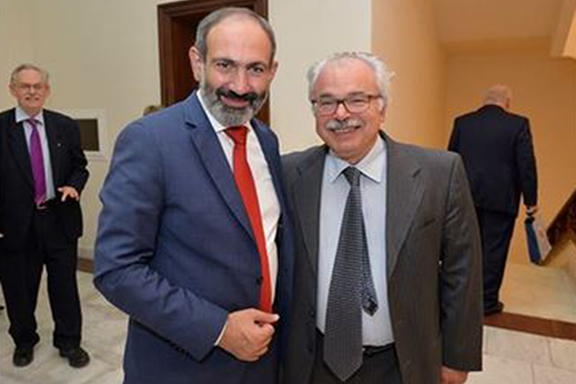 He is a Man of impacabl integrity and truly dedicated to all things Armenian. Hopfully he will accept a permenant position.